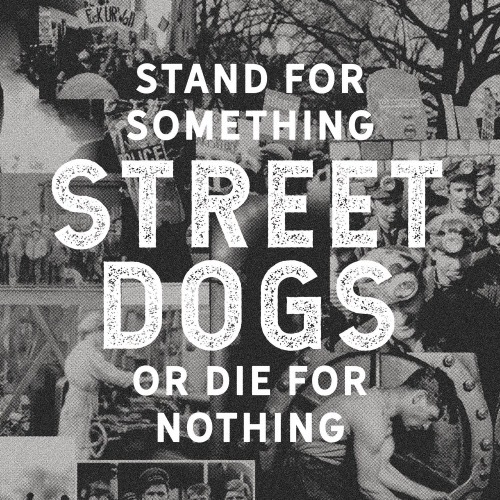 The combination of band, genre and album title couldn’t be more appropriate for Street Dogs’ Stand For Something Or Die For Nothing. Mike McColgan’s experience as a Gulf War veteran and former frontman of the Dropkick Murphys is a natural lead-in to exploring the more politicised side of punk, and with the Bostonians’ first album since 2010, the aim is uniting a divided America that’s only ended up that way through being lied to and manipulated. And as far as that sort of album goes, Stand For Something Or Die For Nothing is an undeniably predictable take that plenty of other bands have adopted well before this; the fact that the title alone became the most trite, overused punk cliché imaginable long ago should be one searing red flag to start with. But predictable isn’t necessarily conducive with bad, and for as straightforward as Street Dogs’ approach is, they hit the mark in a way that incredibly good at getting the job done. And yes, this is punk in the broadest sense, comprised mostly of rallying cries and rousing shoutalongs like the title track or Working Class Heroes, and for those who prefer their punk with a bit more insight, Street Dogs aren’t exactly scratching that itch. What they are doing, however, is doing this rousing material to an exemplary degree. Really, beyond the slight hint of derivativeness, there’s not much that Street Dogs can be faulted for. There’s bounce thanks to an abundance of chunky riffs on The Comeback Zone and Mary On Believer Street, and there’s an enormous sense of vocal presence that goes in tandem with it, with McColgan effortlessly delivering gruff, populist shouts by the truckload, and rapper Slaine’s more assertive bars fitting in seamlessly in Angels Calling. Even in the deviations from the norm like the bracing folk-punk of These Ain’t The Old Days or the blues-tinged cowpunk of Torn And Frayed, Street Dogs never let go of the exhilaratingly charged standard that they set for themselves. That’s honestly enough to make Stand For Something Or Die For Nothing a worthwhile listen, even if it’s more of an addition to the conversation than a guiding voice. Still, Street Dogs make their case known with such energy and vigour that it’s difficult to hold it against them, particularly when the final product is as entertaining as this. Even if its longevity mightn’t be huge compared to more transgressive acts in a similar vein, this is well worth a listen all the same. ‘Stand For Something Or Die For Nothing’ by Street Dogs is released on 22nd June on Century Media Records.